I haven’t bought many traditional cleaning products in years. For the most part, all of my cleaning is done with homemade cleaners. They are non-toxic, extremely frugal, and often clean even better than the chemical laden traditional products. I use a vinegar and water based spray for much of my daily cleaning. I also use baking soda and lemon juice for scrubbing stains in the kitchen. I just love using simple homemade cleaners! 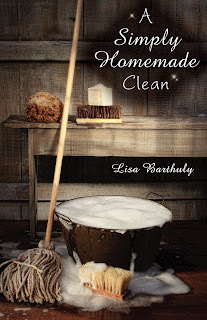 I was given the ebook A Simply Homemade Clean by Lisa Barthuly and I am thrilled to share about it here! It is a wealth of information about cleaning products that are homemade and safe. I am now going to expand my usual cleaning with even more homemade concoctions. Would you like to rid your home of commercial, toxic products but don’t want to pay the price for the ‘all natural’, ‘organic’ products that line the shelf? Learn to make your own! Create everything from your own laundry soap, to homemade dryer sheets, antibacterial spray cleaners, potpourri blends, fabric softeners, calendula salve, homemade ‘Vaseline,’ handcrafted Eucalyptus Chest Rub . . . even tips for the outside of the homestead and much more! Essential oils are the heart of herbs, plants and trees; God’s gifts to us for His way of healing and caring for thesebodies He created. Dating back to biblical times, oils were used for anointing and healing the sick. Scientific clinical research studies of today even confirm and reveal thatmany oils contain very high levels of stimulating immune system properties and a host of healthy benefits for us. Our Heavenly Father has provided so many amazing herbs, natural compounds and such, not only for wonderful medicinal and culinary uses, but to keep us clean and healthy! By creating our own home and body care products with what He has provided, we are being good stewards of the resources He’s given us.We are making a choice each day. God is the giver of all good things, he takes care of us, gives us what we need; He is the Creator and Giver of Life. We can choose Him and what He gives . . . life. This book is so much more than simple homemade cleaning products, in that it points to the Lord. Using what God has already given us to keep our homes clean and healthy. Amen! A Lego Design Wall-Repurposing a Former Schoolroom?